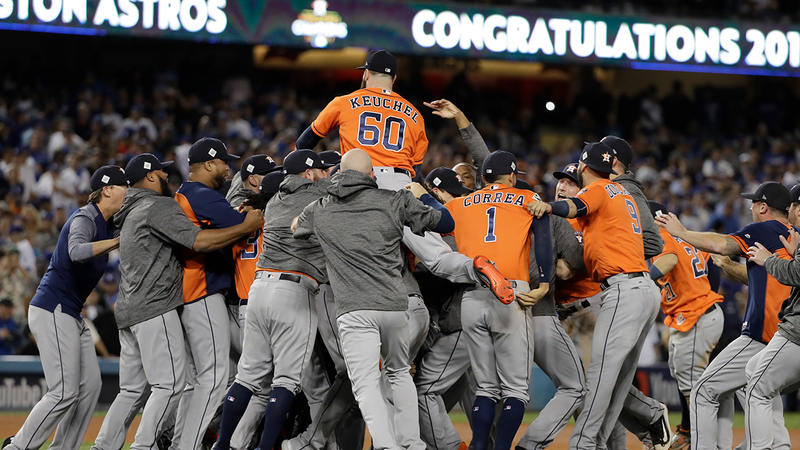 NEW YORK (WABC) -- For the first and final time, congratulations to the Houston Astros, 2017 World Series Champs. But as of now that is old news. On the day after the World Series, just 147 days remained until Opening Day 2018! So what will it take for either the Yankees or Mets to bring a parade to the area next season? Initial odds are out and the Yankees are 8 to 1, which is third choice in the American League. The Bombers are the favorites in the division over the Red Sox. The Yankees are loaded on paper, deep in every position. The main question mark around this team is all about the manager. G.M. Brian Cashman said goodbye to Joe Girardi after 10 seasons. Now he is looking for a more player friendly manager to handle all the young talent on the roster. The Yankees will find out in a couple of days whether Masahiro Tanaka will opt out of his contract. The righty with a gimpy elbow figures to stay in pinstripes. The Yankees will also have to decide if Todd Frazier will be back. The Toms River native is a free agent and could be looking for big money and years. The Bombers will be looking to upgrade the starting pitching staff and make a deep bullpen deeper. Then there are the Mets. Their current Vegas odds are 20 to 1 to win the championship. There are just so many questions concerning this team. New manager Mickey Callaway seems like a good solid choice to take this team forward. But the new skipper will find holes everywhere. There are question marks at first, second and third along with the entire bullpen. However, the health of this team will ultimately decide their fortunes. Will Yoenis Cespedes finally put his leg problems behind him? Can Michael Conforto come back from a serious shoulder injury? But most of all can the starting pitchers stay on the field? On paper they are very good, but as a group they've spent for time at HSS than on the mound. If the starters go down again, this team has no shot to make a run at the Nationals. So, 147 days to go to Opening Day, let the Hot Stove season begin!